Pear: I LOVE TFA Pear, if it was up to me it's the only pear I would ever use at like 10% :) but I wanted to round out the pear for others that might want to try. I used a 1:1 FA TFA Pear mix. I also added a little bit of TFA Quince to round it off. Raspberry: I used what I had, INW and TFA once again to give it a fuller flavor. Cactus: I used a small amount of cactus to add a juicy mouth-feel. Fuji: From my experience with fuji I thought that it would mix well with the profile I'm looking at. This recipe is the property of BradH and released under the CC Attribution-Noncommercial 4.0 license. You may not copy, derive or commercialize this recipe without following the terms of this license or the explicit permission of the creator. This juice is addictive. Normally raspberry is too strong in mixes, but this is perfect. It's sweet, it's juicy and light candy. It's awesome. I don't think the super sweet is necessary, but definitely give this one a shake. I love this mix. Very sweet and juicy. 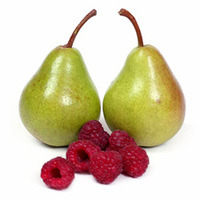 The INW Raspberry is the star here with that pear lingering on your palate. Nicely done. This will be on my list of fruit mixes to keep coming back to for sure. My very first juice I bought over and over again was a pear-raspberry mix and the profile really appeals to me. While this recipe tastes very different from that flavor in that the raspberry takes the foreground, as INW Raspberry does, at least as a SNV, it's fresh and very tasty. Thanks!